GM Hou Yifan Hou Yifan (pronounced ho-yee-fan) was born on February 27, 1994 in Xinghua, Jiangsu, China. Her father, Hou Xuejian, was a magistrate and her mother, Wang Qian, was a nurse. Hou Yifan is the way the Chinese say her name. The Western way is Yifan Hou. In 1997, at the age of 3, her father bought her a chess set and she became fascinated with the pieces. In 1999, at the age of 5, her father hired a chess teacher, International Master Tong Yuanming (1972- ), to coach her. He won the Chinese championship in 1993. In 2000, at the age of 6, Hou Yifan began to play chess regularly. Hou was homeschooled and studied chess. In 2003, the family moved to Beijing to be closer to the top chess academies. In 2003, at the age of 9, Hou played against GM Ye Jiangchuan (1960 - ), the chief coach of the Chinese National men's and women's teams. Hou became the youngest member of the national team. 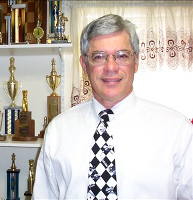 Ye was awarded the FIDE Senior Trainer title in 2005. In August-September 2003, Hou played in her first tournament, the Chinese Team Chess Championship. She scored 3 out of 7 with a 2246 performance rating. In October-November 2003, she took 1st place at the World Youth Championship for girls under age 10, held in Halkdiki, Greece. She won 8 games, drew 3, and lost none. In November 2003, she played in the Chinese National Women's Chess Championship and took 14th place. She scored 3.5 out of 9 and a performance rating of 2202. On January 1, 2004, her first published rating was 2168, which automatically qualified her for the title of Woman FIDE Master (rated over 2100). In 2004, she was admitted to the Chinese National Chess Center in Beijing. Her trainers were GM Ye Jiangchuan and GM Yu Shaoteng. In November 2004, she tied for 1st place in the boys' under-10 section of the World Youth Championship, held in Heraklio, Crete. She scored 9 out of 11, winning 8 games, drawing 2, and losing 1. In December 204, she took 11th place in the 11th Asian Women's Championship, held in Beirut, Lebanon. Her performance rating was 2278. In April 2005, she took 5th place at the 3 Arrows Cup ladies tournament in Junan, China. In that tournament, she defeated IM Almira Skripchenko and had a performance rating of 2393. In July 2005, she took 5th place in the Boys' Under-12 section of the World Youth Chess Championship, held in Belfort, France. In October 2005, at the age of 11, she qualified for the World Women's Chess Championship after winning the Chinese Women's Zonal tournament. Her performance rating in that event was 2526. In March 2006, Hou reached the 3rd round of the Women's World Chess Championship, defeating an International Master and a Woman Grandmaster. Her performance rating was 2504. In May-June 2006, she played Board 4 on the Chinese women's team at the 37th Chess Olympiad in Turin, Italy. She won a silver medal for her board. Her performance rating for this event was 2596. In June-July 2006, she took 4th place in the Chinese women's championship. In October 2006, at age 12, she tied for 1st (losing on tiebreak) in the Girls' section of the World Junior Chess Championship, held in Yerevan, Armenia. She had a performance rating of 2469. In 2007, at the age of 12, she was awarded the Woman Grandmaster title. In May 2007, she won a gold medal playing Board 2 in the 1st World Women's Team Chess Championship, held in Ekaterinburg, Russia. In June 2007, at age 13, she became China's youngest ever national champion, winning the Chinese Women's Chess Championship. She won 7 games, drew 4, and lost none, for a 2585 performance rating. In September 2007, she took 1st place in the Chinese Women's zonal tournament. She scored 7 wins and 2 draws, with a 2675 performance rating. In October-November 2007, she won a gold medal on Board 2 in the 2nd Asian Indoor Games team tournament. She won 5 and drew 1 for a performance rating of 2649. In March 2008, she won the 1st Ataturk International Women Masters Chess Tournament in Istanbul, scoring 7 out of 9. Her performance rating was 2674. In June 2008, she won the Chinese Women's Championship for the second consecutive time. In August 2008, she tied for 3rd place in the boys' section of the World Junior Chess Championship, held in Gazientep, Turkey. She was the only girl in the boy's section and had a performance rating of 2661. She qualified for the grandmaster title at the age of 14 years, 6 months, and 2 days. 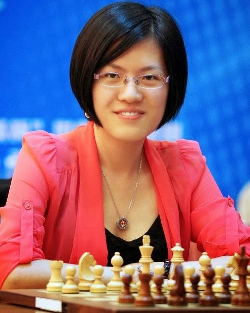 She is the youngest female GM in history and the 27th Chinese Grandmaster. In August-September 2008, she competed in here second Women's World Chess Championship, held in Nalchik, Russia. She lost the finals match to Alexandra Kosteniuk. Hou became the youngest ever finalist for the Women's World Championship title at the age of 14. She also earned the International Master (IM) title. Her performance rating was 2536. In April 2010, she won the Kuala Lumpur Open, scoring 6 wins and 2 draws. Her performance rating was 2730. In August 2010, she won the Women's Grand Prix in Mongolia. In November 2010, she won the women's individual gold medal at the 16th Asian Games in Guangzhou, China. She scored 8.5 out of 9 with a performance rating of 2798. In December 2010, she won the Women's World Chess Championship, held in Hatay, Turkey, making her the youngest women's world champion in history at the age of 16. She defeated Ruan Lufei in the finals. Prior to Hou, Maia Chiburdanidze was the youngest women's world champion at age 17 when she won the title in 1978. Hou's win earned her China Central Television's 2010 award for Sportsperson of the Year involved in a sport that is not included in the Olympic category, and her title win qualified her for participation in the World Cup 2011. In April 2011, she won the 1st Women Master Tournament in Wuxi, China, scoring 7 out of 9 and a performance rating of 2639. In August 2011, she won the FIDE Women's Grand Prix, held in Rostov, Russia. In September 2011, she won the second Grand Prix stage, held in Shenzhen, China. In January 2012, she tied for 1st at the Gibraltar Chess Festival with a performance rating of 2872. She lost on tiebreak games to Nigel Short. In July 2012, she won the 5th leg of the FIDE Women's Grand Prix, held in Jermuk, Armenia. In August-September 2012, she won the gold medal for women's Board 1 at the 40th Chess Olympiad, held in Istanbul. In September, 2012, Hou started studying International Relations at the University of Beijing. In November 2012, she was knocked out in the 2nd round of the Women's World Chess Championship, held in Khanty Mansiysk, Russia. The event was won by Anna Ushenina of the Ukraine. In September, 2013, Hou defeated Anna Ushenina in a match for the Women's World Chess Championship, held in Taizhou, Jiangsu, China. She scored 5.5-1.5 to regain her championship title. In August 2014, she won the silver medal on Board 1 of the Chinese Women's team in the 41 Chess Olympiad, held in Tromso, Norway. In October 2014, she took 1st place in the Corsican Chess Circuit, defeating GM Sergey Fedorchuk in the final. At the end of 2015, 20-year-old Hou Yifan was the reigning Women's World Chess Champion, the 2nd highest rated female (behind Judit Polgar), the highest rated girl (under 21), the 4th highest rated junior, and ranked 71 in the world (men and women include) with a rating of 2673. In January-February, 2015, she tied for 3rd place at the Gibraltar Chess Festival, scoring 7.5 out of 10. She had a performance rating of 2772 and a FIDE rating of 2686. Her rating passed Judit Polgar for the first time, ending Judit's 26 consecutive years reign as the top rated female player in the world. In March 2015, Hou decided not to defend her world championship title and played in the Hawaii Grandmaster Challenge instead (she had already committed to this event). She won the event and Mariya Muzychuk won the 2015 Women's World Chess Championship, held in Sochi, Russia. In April 2015, Hou reached her highest rating to date, 2686. She was then ranked #59 in the world. In September-October 2015, she played in the Chess World Cup in Baku. She lost in the 2nd round and had a performance rating of 2685. October 2015, was the original date for the Women's World Chess Championship match between Hou Yifan and Mariya Muzychuk, but Muzychuk proposed to delay the dates due to other tournament conflicts. FIDE agreed without asking Hou's opinion, who was in school and needed time to study. She was working on a university thesis on Mao's Cultural Revolution of the 1960s. In October 2015, she won the first leg of the FIDE Women's Grand Prix, held in Monte Carlo. In February 2016, she was supposed to play a chess match against IM Cristobal Henriquez Villagra of Chile in Antarctica, but the weather did not cooperate. It would have been the first FIDE rated game in Antarctica. The match was played in Punta Arenas, near the southern tip of Chile. Hou won the match with 2 wins, 1 draw, and 1 loss. On March 1-18, 2016, Hou Yifan (rated 2667) reclaimed the Women's World Chess Championship title when she defeated Mariya Muzychuk (rated 2563), held in Lviv, Ukraine (Muzychuk's home town). She won 3 games and drew 6 games with a performance rating of 2685. The prize fund was decreased from 300,000 Euros (the original bid) to the minimum of 200,000 Euros. The money was split, 60% going to the winner and 40% going to the loser. During the match, Muzychuk complained that Hou was wearing jeans and against the dress code (there was no dress code in the contract). Muzychuk also complained that Hou's bottled oil smelled bad and disturbed her thinking. Hou never actually opened her bottle of oil. This Women's World Chess Championship was played in a small room at the Potocki Palace and allowed no spectators. The room was part of an art gallery. Main arbiter Carol Jarecki had one painting removed titled "Chronos disarms Cupid." She felt that a naked Cupid was not appropriated to appear in any photo of the match. There was a half hour game broadcast transmission delay after every chess move as part of FIDE anti-cheating measures. There were also metal detectors and the Chinese team wanted mobile phone blockers. However, phone jamming was illegal in the Ukraine and not implemented. Hou has now played 3 world championship 10-game matches (against Koneru, Ushenina, and Muzychuk) without losing a single game and has won the title four times. In May 2016, Hou dropped out of the current Women's World Championship cycle. She objected to the format of a knockout tournament and then a match. She compared the 64-player knockout system to a lottery. In June 2016, Hou only scored 2.5 out of 9 at the Gashimov Memorial Chess Tournament. Her rating fell to 2653 and she was no longer in the top 100 chess player list (#105 in the world). Her rapid rating is 2631 and her blitz rating is 2704. She is rated almost 100 points higher than the 2nd highest rated female (Humpy Koneru — rated 2575).